Michael and Jenna Gray run Little Quoin Farmhouse, and they produce the most amazing free range Berkshire pork. Their farm is in the Coal River Valley and their pork is so popular that they regularly sell out at the Market. The BCFM Committee warmly thank Jenna and Michael for their support and can’t wait for the next market so we stock up our fridges with beautiful pork products once again (and sneak in a tasty pork roll while we’re there!). If you are in charge of preparing the Christmas ham this year, Jenna’s amazing recipe below just cannot be beaten – it was one of our favourite recipes while photographing food for the cook book and comes highly recommended! This recipe also contains instructions on how to pickle your own pork, very handy and a great technique to know how to do yourself. Place the pickled pork into a large stock pot and fill with enough water to cover the pork. Roughly chop the onions, carrots and celery, and add to the pot along with the peppercorns, coriander seeds and cinnamon. Cover with a lid and bring to the boil over high heat, then turn down the heat to gently simmer for 2 hours. Top up with water occasionally. Gently remove the pork from the pot and place onto a board. Carefully cut the stocking/string away from the pork. Using a sharp knife, remove the pork rind without removing the fat. Score the fat in a crisscross fashion, taking care not to cut into the meat. Stud each diamond with a clove. Place into a heavy based roasting dish. Put raw sugar, Madeira wine, leatherwood honey and sherry vinegar into a small saucepan and bring to the boil over a medium heat, stirring until the sugar is dissolved. Pour half of the glaze over the pork and place into oven for 15 minutes. After this time is up, pour the rest of the glaze over the pork and continue to bake for 35 minutes, basting with the pan juices every 10 minutes. Remove from the oven and rest for 10 minutes before carving. The ham can be served hot or cold and will keep for 2 days in the fridge. 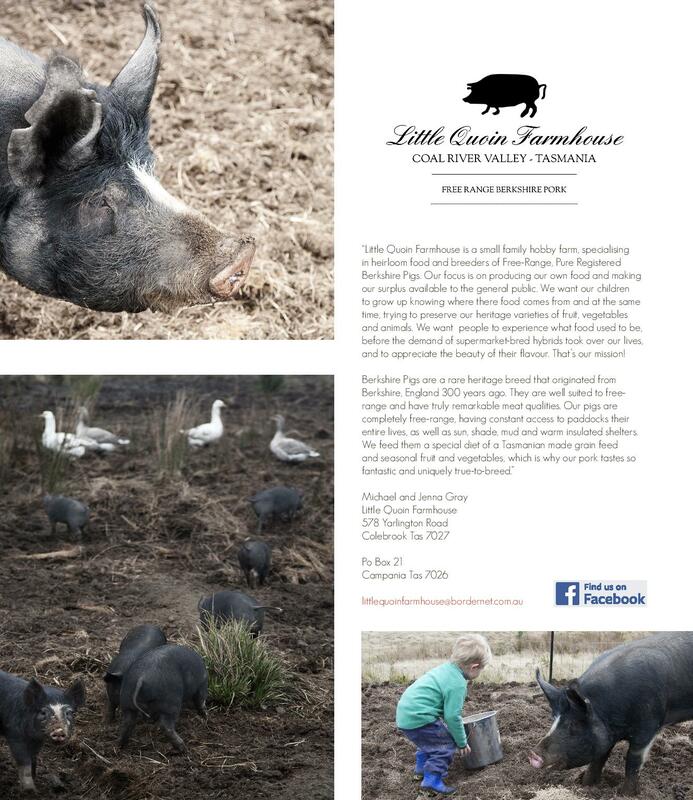 Free range Berkshire pork is available from Little Quoin Farmhouse at the Bream Creek Farmers Market. You are able to order meat directly as well as sampling their beautiful products. Be sure to try their succulent roast pork rolls which are a firm favourite at the Market. To pickle your own pork leg, weigh the pork and place in a plastic container with a lid. Make a salt water solution by using 100g of salt for each kilogram of pork and sprinkling the salt into the container. Pour in enough cold water to submerge the pork. Place a weight such as a ceramic plate on top of the meat to keep it submerged. Cover the container with a lid. Place the container in the bottom of the fridge for four days. After four days, remove from brine and use as per recipe.